Do you have question or problem? How to import a certificate in Mozilla Firefox from .pfx or .p12 backup file? From the browser menu, click on the right upper button and select Options, than select the Privacy & Security option from the menu on the left side, go down and click on View Certificates. From tab Your Certificates, select Import, than select the file with your certificate. Enter the password which you have set during the backup procedure for the certificate. You will receive a message that your certificate was successfully imported. How to make a backup file of Verba Sign K1/Pro1 or Verba Seal S1 certificate from Internet Explorer? Enter a password to protect the private key. The password is only known by you, please remember it or write it down in a safe place! 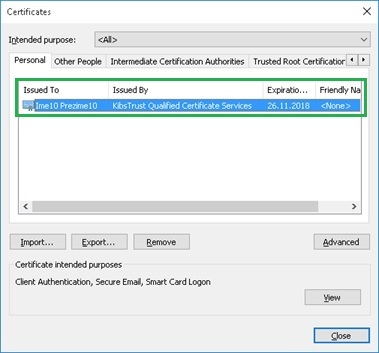 Enter a file name and location to which you will export the certificate. At the end, you will get a message for succesful export. How to import a certificate in Internet Explorer from .pfx or .p12 backup file? How to make a backup file of Verba Sign K1/Pro1 or Verba Seal S1 certificate from Mozilla Firefox? Enter a file name and location, choose the format of the file in which you will export the certificate (.p12). Click on Save to continue. Enter a password to protect the private key. The password is only known by you, please remember it or write it down in a safe place! How to change the user PIN for the Gemalto ID Prime PKI token? At the end, a message for a successful change of the PIN is displayed and we press OK.
© 2018 KIBS AD Skopje. All rights reserved.